Well Desk is customizable for individual height and ergonomics. 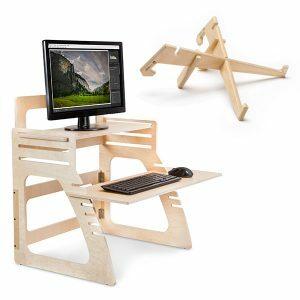 Well Desk sits atop any standard desk, instantly converting it to a standing desk. Multiple slots provide versatile positioning of the keyboard and monitor shelves. Dozens of combinations guarantee natural posture and all-day comfort. Well Desk is made of four precision-cut, wooden components — the base, the keyboard shelf, the monitor shelf and the rear safety guard. The desk components interlock snugly and securely. No need for tools, additional hardware or glue. The desk can be completely assembled in only 60 seconds. It is really that easy! Check out the assembly video to the right. Well Desk is made in the U.S.A. using the very best materials, finest craftsmanship, and precision cutting to ensure that your desk is absolutely rigid in its construction. Your monitor and keyboard will stay perfectly motionless, without shaking or vibrating when typing. The rear safety guard ensures that your monitor will never fall off the desk. The desk holds up to 35 pounds with ease. Sustainably-sourced Baltic birch plywood is incredibly strong and lightweight. The high quality finish ensures a durable, damage-proof desk surface. Well Desk incorporates several sleek design elements to satisfy and impress. 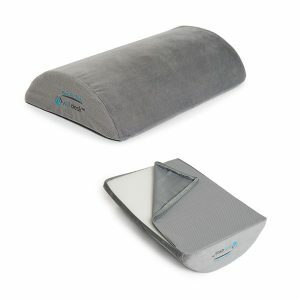 Ingenious, folding design facilitates storage and mobility. Cut-out cable feeds keep your workspace organized and uncluttered. Rear monitor guard protects your equipment from sudden shifts in the space-time continuum. Clean, sophisticated lines in neutral colors add professionalism and elegance in one. Well Desk will help you live well, work well and be well. Numerous studies and reports strongly correlate standing up with improved health and productivity. Experience substantial decreases in back, neck and other musculoskeletal pain. Improve blood circulation to nourish muscles, heart, lungs and brain. Burn more calories, lose weight and build stronger muscles. Boost concentration, mental clarity and productivity. We assume that you, the savvy consumer, have spent some time shopping around for a standing desk, and have discovered for yourself that many standing desks are both expensive and rather complicated. Well Desk is the simple solution that comes at an affordable price point — not much more than that little monthly coffee habit of yours, but one with long-lasting benefits. 100% money-back guarantee on customer satisfaction and product performance. 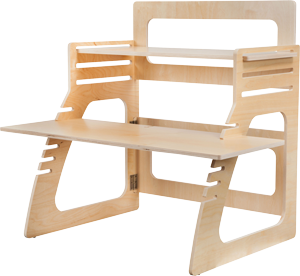 Fits on top any standard desk – no need to change out your existing desk. Adjustable, beautiful, simple, sturdy, and affordable; your working capabilities just got a whole lot smarter. Taking into account the most common problem associated with using a computer, Well Desk brings you an innovate desk made to change the way that you work once and for all. Helping to relieve your neck and back pain, our desks are designed with our users in mind. Customized to fit any individual, this adjustable desk can be moved into dozens of different configurations, easily converting to your desired height. Incorporating several additional design elements, Well Desk is made to impress. Combining folding storage components with cut-outs for cables, our desk designs make organization and comfort a breeze. But its simplicity does not stop there. Made to be converted without any motors, hydraulics, or wires, Well Desk is designed using sturdy, precision-cut woods, creating an interlocking system of shelves that do not require any tools, hardware, or glue. Designed to hold both one and two monitors, you never have to worry about your desk shaking or moving out from under you. In addition to its sleek and sophisticated look, Well Desk is created to enhance your comfort on its most basic level. Reducing tension in your back neck and shoulders, you can build your muscles allowing you to concentrate on your work with much more clarity, increasing your overall productivity and happiness. With Well Desk, you can work well, live well, and be well. There is no reason not to get yours today. Order your Well Desk now.